The home page is divided into two columns. The left column of the home page may include a welcoming video, image, message or web resource, or a combination of the latter in an authored page. 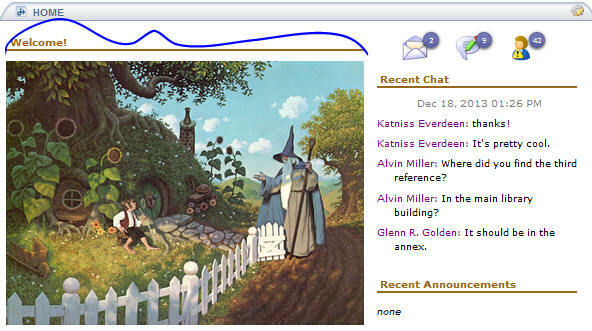 On the right, you may have recent announcements, recent chat room messages, and a calendar showing what is open or due today. At the very top of the right column, activity indicators inform users of new activity. Placing the mouse over an icon displays the information that it lists. They show how many private messages and unread discussion posts they have, and if they haven’t reviewed any graded work. 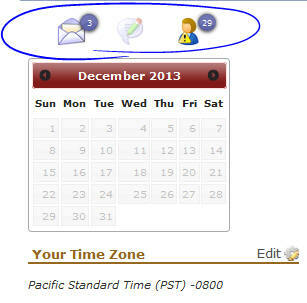 Instructors see the following indicators, informing them if they have private messages or unread posts, and how many students have not visited the course site in the last seven days. 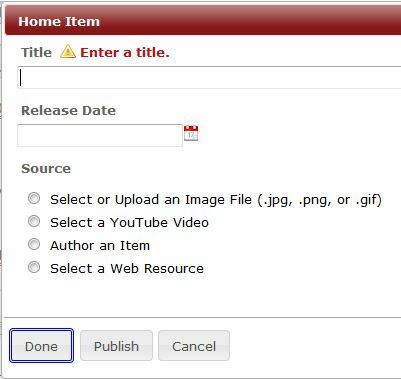 Clicking on an icon takes users directly to the specific area that has activity – private messages, discussion topic, Activity Meter, or to the review page of an assignment to view the instructor’s feedback. You have a number of options that control how items are displayed in your home page and what’s displayed. First, you can select to display items in wide screen or split screen. To set your preference, click on the Edit icon to the top right corner of Home. Then, click on Edit under Options, and select the desired “Display Format”. The wide screen option gives you 2/3 of the screen for a video, image, web page or composed message. The split screen divides the screen in half, as in the following example. You have the ability to select which tools to display in your Home page, and in which order. Click on the edit icon at the top right corner of Home. Click on Edit by Options. Use the check boxes to select which tools to display or remove. You may even uncheck all the tools and have the full screen for a video or a greeting. To display the tools in a new order, hold down with the mouse at the blue up/down arrows to drag and drop a tool to a new position. 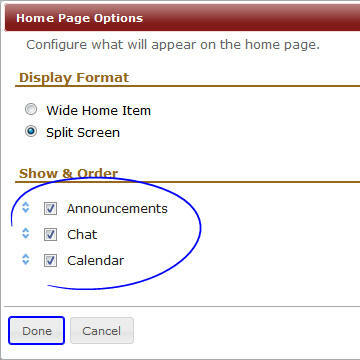 You may also set how many announcements you want listed in your Home (maximum of five). 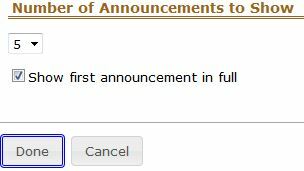 You also have the option to display the first announcement in full. 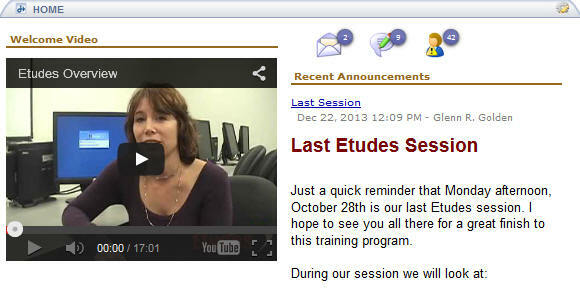 The remainder of the announcements are displayed as links that open the full announcement in a popup window. Click on Done to preserve the new display order. To add items to your Home, click on the edit icon to the left top corner of the page. Enter a title and select the type of item you want to add.